Have I mentioned how much I miss my good camera? I wish the photo of that piece of cake was more in focus. It makes me feel like I need to get a new pair of contacts. Oh well, it tasted yummy! I adapted this from a recipe in the Cake Mix Doctor cookbook. I love this book. Mine is well used. The recipe actually calls for buttermilk. I never buy buttermilk and instead just sour the milk with a Tbs. of vinegar for each cup of milk. However, I was in a huge hurry when I made this cake and just grabbed the milk and poured it in before I soured it. Plain milk worked fine. Mix all the ingredients in an electric mixer until well blended. Pour into a 9×13 pan that has been greased. Bake for 40-45 minutes at 350 degrees. 1 stick butter, at room temp. 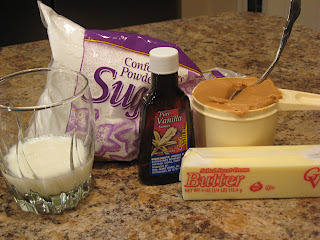 In an electric mixer blend the butter and peanut butter. Add the other ingredients and mix until smooth and spreadable, mixing in the extra Tbs. of milk, if needed. 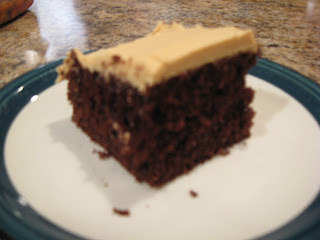 I love chocolate cake with peanut butter frosting! It’s my favorite:0) Yum! Perfect …. 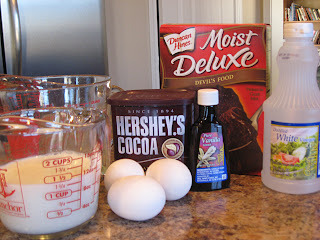 I am making this tonight… I don’t have boxed cake mix. Drag… Have to make it from scratch.. But the family will love it thanks for sharing this my husband will be so happy! You had me at chocolate cake. The PB? Made me drool. Oh. My. Goodness. In the name of everything that is delicious, I want to eat my screen. The Cake Mix Doctor is one of my favorite cook books. My favorite recipe is The Best Darn Chocolate Cake (or something close). I don’t even bother frosting it because it’s so good on it’s own. Love the Cake Mix Doctor, also. Notice I’m not giving that one away – it has lots of smudged pages. 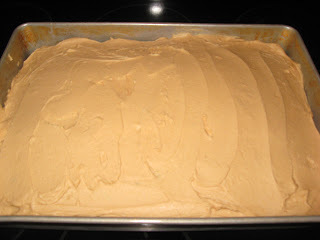 I will have to try the pb frosting – that looks great even if it is fuzzy. This sounds yummy! I’ve never thought of Peanut butter frosting! You can never have too much chocolate or peanut butter! Looks like a tasty recipe. Oh that looks great I will have to give this a try. I think I’m going to forward this to the husband for consideration for my birthday. I love choc cake with pb icing but always have to make my own because it’s very “pour in some of this, add some of that, maybe more of that…”. Hard for him to follow my recipe but easier to use yours! Made this cake- the icing is heavenly! left the cake in the oven a bit too long- so it was dry- but it was still good! Yum. I used to make this all the time. Thanks for the reminder about peanut butter frosting. Chocolate and peanut butter are always a good idea! !